Drop 3 of the framework has a few changes to the property pane APIs in the sp-client-preview package, and some small fixes to the build toolchain. 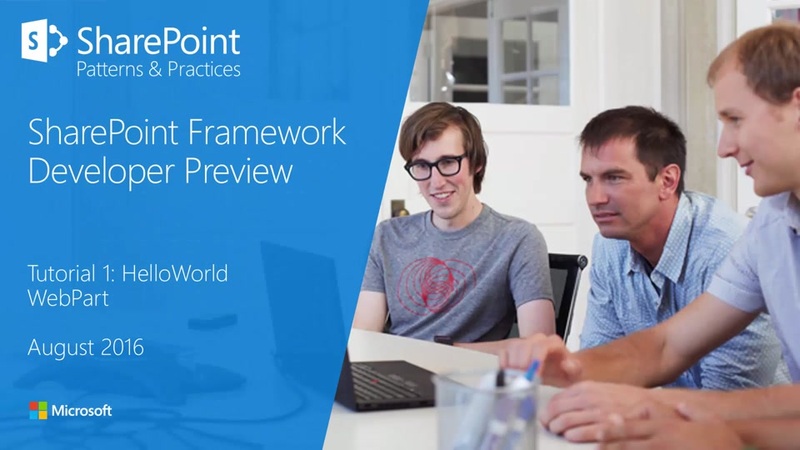 New drop #4 on the SharePoint Framework npm packages are now available! Check release notes on the included changes and addressed issues. Vesa Juvonen announced the availability of the (long awaited) CDN features for SharePoint Online. The SharePoint Online CDN features allows you to turn one or more libraries in your SharePoint tenant into a repository for assets that you want to store in a CDN for performance reasons and geo-distribution reasons. Microsoft introduces Webhooks for SharePoint. Webhooks are an increasingly common developer notification technology used across the industry in various web applications to inform each other about changes in their respective systems. Details on the Feature Pack 1 for SharePoint Server 2016 upcoming in November are available now. In this PnP Web Cast you will concentrate on showing how to get started with upcoming SharePoint Webhooks. SharePoint Webhooks allow developers to build service integration which subscribe to receive notifications on specific events that occur in SharePoint. In this PnP Web Cast all the key capabilities in new PnP Partner Pack v2.0 release are covered. TechNet Radio host Yung Chou welcomes David Johnson, Senior Program Manager, to discuss how Microsoft IT migrated more than 185,000 on-premises internal SharePoint sites and portals to the cloud. If you want to get your MCSA #Office365 Certification, you may find this reference/study guide from Vlad Catrinescu very helpful! In this article, you will see how to interact with site collection features in SharePoint 2016, using REST API. The scope of the article is, fetch all the active site collection features, activate Publishing feature, deactivate Publishing feature. The developer experience has changed for SharePoint Provider-hosted Add-ins that require Tenant permission in combination with app-only. This article walks you through the new experience for developing and debugging these solutions. With the Office 365 dev/test environment in Azure, you can follow step-by-step instructions to configure a simplified intranet in Azure infrastructure services, an Office 365 Enterprise E5 subscription, and directory synchronization for Azure Active Directory (AD). These architecture tools and posters give you information about Microsoft cloud services and platforms, including Office 365, Microsoft Azure, Microsoft Intune, Microsoft Dynamics 365, private cloud datacenter, and hybrid on-premises and cloud solutions. Bulk UPA Custom Profile Properties Update API is now available across all SharePoint Online tenants. The SharePoint Framework (SPFx) has as all decent frameworks a built-in logging mechanism, albeit very simple, but still yet valuable. Read this article by Wictor Wilen to find out more. Create live tiles and add them to your SharePoint. This add-in works in: SharePoint 2013 or later, SharePoint Online. Assessment tool for SharePoint 2013 servers before migration to SharePoint online. In this article, common tools and strategy for deploying SharePoint Online successfully are described. 7 tips on how to get yourself familiar with new featuresj available in Office 365. A step by step instruction on how to change the logo and a color of a suite bar in your Office 365 tenant. The product group released the September 2016 Cumulative Update for SharePoint Server 2016 product family. This is the second CU for SharePoint Server 2016 after RTM. Microsoft has announced the rollout of several new enhancements to SharePoint Online team sites in Office 365, including deeper integration with Office 365 Groups. In episode 108 of the Office 365 Developer Podcast, Andrew Coates talks with Microsoft Program Manager Chakkaradeep Chinnakonda Chandran about the SharePoint Framework and SharePoint WebHooks. In episode 107 of the Office 365 Developer Podcast, Andrew Coates talks with Max Knor, Microsoft program manager, about Dev Ops in an Office Developer context. Here’s a look at new reports for SharePoint Online, OneDrive for Business and Exchange Online. Office 365 Groups is a great tool for collaboration within a team inside an organization. There will be occasions when you need to work closely with customers, partners, and others outside of your organization. To solve this problem, Microsoft is announcing the new guest access feature for Office 365 Groups which gives you the ability to include people outside of your company in an Office 365 group. The new Universal Windows Office Lens app gives your Windows 10 PC, tablet, phone or even HoloLens scanning superpowers. On September 7 Microsoft announced the general availability of Office 365 from multiple local datacenters in the United Kingdom. This tutorial will guide you in building a simple client-side web part using the SharePoint client-side development tools. Please check all 6 episodes in the series: start working with the framework, talking to SharePoint, serving in SharePoint page, deploy to CDN, jQuery Accordion WebPart, using Office UI Fabric components. Presentation by Kanwal Khipple from 2toLead on the future of organizations and new ways to collaborate. Online SharePoint Framework Documentation from Microsoft. Three main players of business cloud services have an array of products covering all you can possibly need for your online operations. But there are differences not only in pricing but also in how they name and group their services, so let’s compare one next to another and find out what they offer. by bundling them together with the Web Part. But is it really a good idea? In this post, using a premade flow template, Merwan Hade is going to walk you through how you can quickly copy new members from a MailChimp member list to a SharePoint Online custom list based on approval via email. A quick five bullets of info to the best places to keep an eye on what is happening throughout the SharePoint of Things – news, announcements, futures, help and how to, and community discussions. Stefan Bauer shows how to add custom gulp tasks in the pipeline of the new SharePoint Framework. This blog post by Waldek Mastykarz shows how you would build your solution as a Client Side Web Part with the SharePoint Framework released. SharePoint Framework projects can be built in the debug and release mode. This blog post by Waldek Mastykarz guides you through the 5 key differences between the two. Custom Fields samples for the SharePoint Framework (SPFx), as DatePicker, PeoplePicker, ColorPicker, FontPicker, FontSizePicker, PicturePicker, SPListPicker, SPFolderPicker, Password, Phone Numbers, Regexp Masked Input, Map point picker, etc. property fields. These samples can help you to personalize the Edit Properties Panel for your WebParts. Short article about retrieving Content Type using REST Call. Monday, September 26, 2016, 16:00 am – 21:00 Minsk time (see your time zone). Wednesday, September 28, 2016, 20:00 Minsk time (see your time zone). IT Showcase brings together subject matter experts from SharePoint at Microsoft course to answer your questions about how Microsoft IT designs, implements, manages, and supports SharePoint at Microsoft.